Our Best Shot: Workshop Kit is designed for community leaders hosting workshops for seniors and their caregivers on the basics of vaccination. The “soup-to-nuts” kit covers how vaccines work, common vaccine-preventable diseases, vaccine safety and efficacy, the vaccine schedule for adults 60-64 and 65+, and where and how to get vaccinated. 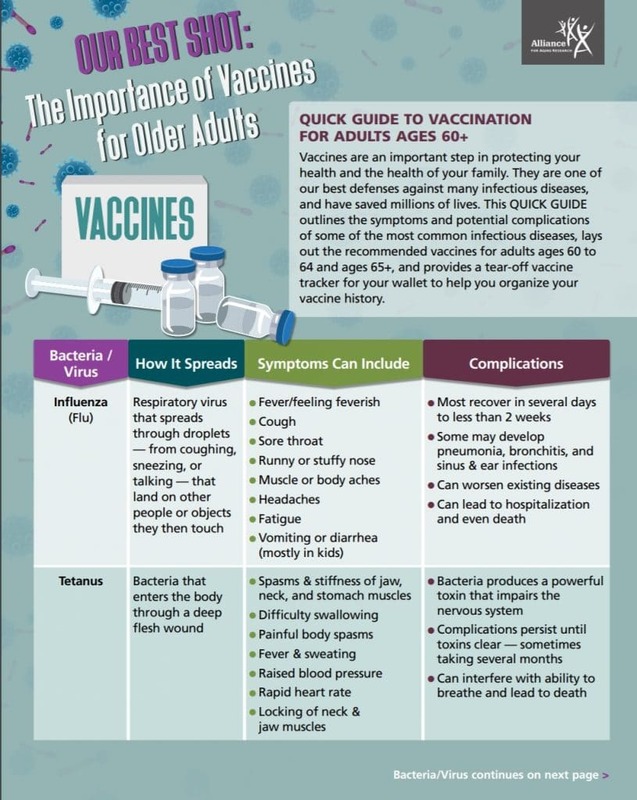 This Quick Guide to Vaccination is designed for participants to take-home with them and includes information on vaccine-preventable diseases and the vaccine schedule for adults ages 60 – 64 and 54+, plus a wallet-size vaccine tracker to help them keep track of their received and needed vaccinations.